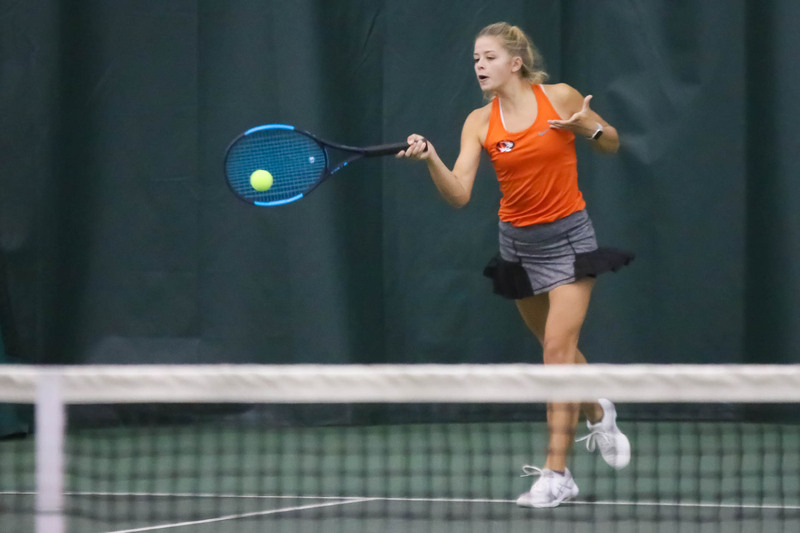 Kaitlyn Snyder’s standout tennis career at Republic came to an end just short of the medal stand at the Class 2 state tournament in Springfield. Snyder lost her third match of the tournament in a third-set tie-breaker, 10-7, to Ella Kinder of Rockwood Summit. A win would have secured a medal for Snyder. Despite the disappointing finish, Snyder still made a bit of history. Her second-round win was the 30th of the season, making her the first Republic player to reach that single-season mark. She’s just the 13th girls player in Missouri history to win 30 matches in a season. Kinder jumped ahead 6-1 in the first set of their match, but Snyder responded with a 7-5 win in the second set. Because rain had caused delays in the schedule, the match was decided by a modified tiebreaker instead of a full third set, and Kinder squeaked by with a victory. The tournament had started with a tough draw for Snyder, who faced Colby Kelly of Liberty. Kelly is ranked in the top 400 nationally. In the second match, Snyder overcame a slow start to blow out Madalyn Smith of Fort Zumwalt South, 6-3, 6-0. Snyder finished ninth at state for the second straight year, and is the closest to a Class 2 state medalist of any Republic tennis player. She also won titles at Nixa, Republic, and in the Central Ozark Conference Tournament in 2018. And she was the first Republic tennis player to reach the finals of the Springfield Invitational, where she finished second. “Kaitlyn obviously played a huge role in our program the last four years. She won a ton of matches for us and set an example for the other players on the team,” Vales says.